Is Yankee Stadium’s Rough Start Bad Karma? Today’s Wall Street Journal takes an intense look at the new Yankee Stadium with an article entitled, “Yankee Stadium’s Ugly Start : Cheap Home Runs, Empty Seats and Lopsided Losses Have Some Asking, ‘Can a Stadium Fail?‘” It’s a well done piece which looks closely at what (overall) make a stadium succeed. However, the article does not mention the destruction of one and a half Parks in the green-space challenged South Bronx or the axing of the 400 trees in the creation of the new Yankee Stadium. 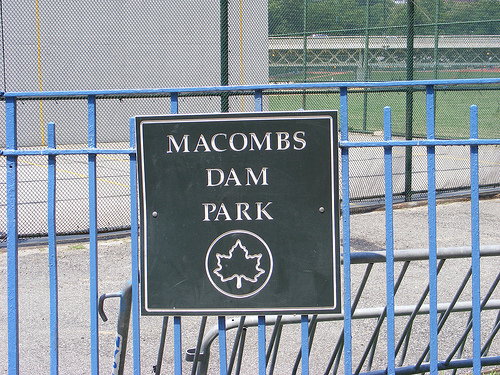 Or the fact that the team could have just played elsewhere for a year and then rebuilt on the site of the former Stadium (as had been done in the past) but that would not happen in Mayor Michael Bloomberg’s New York because corporations are not supposed to encounter any difficulty or inconvenience. Just every day people. And then… who pops up at the end of the article? NYU President John Sexton, no stranger to destruction of old, charming and neighborhood-oriented New York. Well, that blogging break lasted one day but I have a bit of information for you … NYU has announced that this year’s graduation ceremony will again take place at Yankee Stadium (the new one for which close to 400 trees and 1.5 parks in the Bronx were sacrificed*) because Washington Square Park, their favored graduation spot, will still be under construction by the May 13th date. In 2008, the first in which NYU used Yankee Stadium as its graduation site, it was believed that location was a one time thing and that Washington Square Park’s reconstruction would be finished in time for the 2009 ceremony. But as the project is delayed, it is also over budget. NYU gave a rather paltry $1 million towards the park’s redesign. They consider Washington Square Park part of their campus and they own basically all the real estate surrounding the park. As we know, in NYC, real estate talks. NYU is definitely playing a behind-the-scenes role in Washington Square Park’s radical overhaul. So, it is a shame that the park is not ready for this year’s graduation so that this very important ceremony could take place in their Park, don’t ya think? As I wrote last year, I think NYU and Yankee Stadium are perfect together. The Yankee Stadium “replacement” Parkland costs, originally projected at $ 116.1 million, have now risen 67% to close to $195 million, according to a report released yesterday by the Independent Budget Office as reported in Crain’s New York Business. The only reason we know this is due to the fact that the Independent Budget Office is “a city agency that operates independent of the mayor.” I didn’t know any existed — agencies operating outside of the mayor’s reign — so this is mildly reassuring! The article attributes “design revisions, project additions, unanticipated cleanup of hazardous materials and construction inflation” as the reason for the skyrocketing costs given by the NYC Parks Department. The Yankees had a perfect right to make the best possible deal for themselves, even though somebody like the IRS is eventually going to ask why the assessed value of the land the Yankees needed to build the new Yankee Stadium went from $26 million to $204 million one day because that’s what the bond underwriters wanted. Nobody ever doubted that the Yankees, and the Mets, would get the additional tax-free bonds the city’s Industrial Development Agency gave them Friday. The IDA does what it is told by Bloomberg the way our valiant City Council does on term limits. You are not supposed to say no to this mayor. You are not supposed to say no to the Yankees when they want an additional $370 million in these tax-free bonds (on top of the nearly $1 billion in tax-free bonds they’ve received originally). All you are supposed to do is this: When told this is a sweetheart deal for the city instead of for the Yankees, you are supposed to nod your head and act grateful. These aren’t stadium deals between Bloomberg and the baseball teams. They are mergers. And Bloomberg needs them as much as the Yankees and Mets do. Because without them, New Yorkers would start asking this mayor who promised big, huge growth projects where those projects are. Today’s New York Times has additional information in its article, “Report Cites Unexplained Costs of New Parks in the Bronx” (apparently $16 million is unaccounted for), to which the Parks Department responds: basically, that’s “old news.” Story here. The Bloomberg Administration agreed to obliterate one and a half parks (and 400 trees) in the green space-challenged South Bronx with the City’s highest asthma rates in order to provide the Yankee Corporation the land for a new stadium. More and more details about this “deal” keep being revealed and it’s just as murky as you might expect. The Bloomberg Administration aggressively pursued a bigger luxury suite and gave the Yankees 250 parking spots and three advertising billboards in their push to wrangle this. This is on top of already having given them city (park) land to put their stadium on and allocated taxpayer funds for the questionable rebuilding of the two parks. The city’s push for the perks has been known, at least broadly speaking, since Mr. [Richard] Brodsky [New York State Assemblyman] began raising questions earlier this year about the stadium deals for the Yankees and Mets, from whom the city also secured a luxury box. But the e-mail messages offer a revealing snapshot of the behavior and marching orders of the people involved in the deal for the construction of the billion-dollar Yankee Stadium. It’s an interesting read and is quite revealing about the methods of the Bloomberg Administration. At the same time, the city gave so much to the Yankees. It would have been great if they had fought so hard to keep our two Bronx city parks in place. It’s just another example of how arrogant and out of touch Mayor Michael Bloomberg is, always ready to put the wishes of private developers and corporations over people and their communities. Fans of Sayreville’s own Bon Jovi have apparently learned how to defy the laws of gravity! Either that, or Mayor Bloomberg and his administration are once again rolling over for sports teams and leagues. Back in August 2004, as it was becoming crystal clear that the Bush administration had cynically exploited the Sept. 11 attack to drag America into a pointless war in Iraq, thousands of people from around the world came to New York to voice their outrage during the Republican National Convention. Anti-war groups hoped to channel that anger with a massive demonstration in Central Park, but the city refused to issue the necessary protest permits. Peace, love and understanding, the city argued in federal court, is not healthy for Great Lawn grass and other living things. But when Major League Baseball and its corporate sponsors decided to host a Bon Jovi concert this coming Saturday, in conjunction with the July 15 All-Star Game at Yankee Stadium, nobody in the Bloomberg administration apparently raised a Sambora about the grass. Is Bloomberg livin’ on a prayer, hoping Bon Jovi fans will hover over the Great Lawn? The Bloomberg administration will argue that this is all about numbers – the 60,000 rock fans expected for the Bon Jovi concert won’t have the same impact on the grass as the 250,000 protesters United for Peace and Justice hoped to rally in Central Park in 2004. But given how Bloomberg has consistently put the greed of the sports teams – especially the Yankees, Mets and Nets – over the needs of ordinary citizens, you don’t need a weatherman to know which way the wind blows. As Daily News columnist Juan Gonzalez pointed out last week, City Hall is backing a Yankee request for $366 million in additional tax-exempt financing to complete the new Yankee Stadium – a very expensive handout for a private business that employs a tiny number of New York residents. Lawyers for Willets Point businesses, meanwhile, say the city has refused to provide even basic services to the neighborhood for years. So is it coincidence or conspiracy that the city has decided to use eminent domain to throw out the junkyards and body shops just as the Mets are putting the finishing touches on their nearby new stadium? Bloomberg, meanwhile, has been a shameless cheerleader for Bruce Ratner’s Atlantic Yards project, which has become an international synonym for a shameless corporate land grab. A free Bon Jovi concert might be a nice midsummer gift. But stop rolling over every time a sports official asks for a favor, Mr. Mayor. Some New Yorkers would rather protest a bloody and immoral war than chill out with bland suburban rock. I’m impressed by sports writers. They inject passion and reflect on history in a way that, for the most part, political writers and media covering City Hall don’t. If politics was covered the way sports is, perhaps more people would know what was going on and the world … our City … would be a different place. Mayor Bloomberg apparently has adopted a bunker mentality on the new Yankee Stadium project, as serious questions arise over “equal” replacement of parkland, huge cost overruns, questionable financing and other issues. Parks Commish Adrian Benepe is now under orders to pass any media inquiries about the project directly to Mayuh Mike’s press office. Maybe City Hall needs to build a bunker under the new stadium.